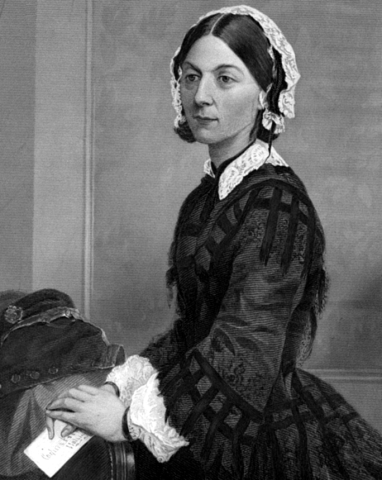 Florence Nightingale was a British nurse, hospital reformer and humanitarian. She was born in Florence on 12 May 1820, and named after the city, while her parents were in Italy as part of a tour of Europe. Nightingale’s early life was spent, in the main, in Derbyshire. Her father tutored her in the classics. Aged about 17, Nightingale felt that God was calling her to do some work but wasn’t sure what that should be. Her interest in nursing began to develop, but nursing had a poor reputation and her parents felt it was inappropriate for a woman of her class and background. She was expected instead to make a good marriage and live a conventional upper class woman’s life. However, Nightingale’s parents eventually relented and in 1849 she went abroad to study the European hospital system, and in 1850 she began training in nursing at the Institute of St Vincent de Paul in Alexandria, Egypt. She subsequently studied at the Institute for Protestant Deaconesses at Kaiserswerth, Germany. In 1853 she became superintendent of the Hospital for Invalid Gentlewomen in London. After the outbreak of the Crimean War in 1854, Nightingale, stirred by reports of the primitive sanitary conditions and grossly inadequate nursing facilities at the large British barracks-hospital at Üsküdar (formerly Scutari, now part of Ýstanbul, Turkey), dispatched a letter to the British secretary of war, Sidney Herbert, volunteering her services in the Crimea. At the same time, unaware of her letter, Herbert proposed that she assume direction of all nursing operations at the war front. She set out for Scutari accompanied by 38 nurses. Conditions were appalling, rife with filth and rats. She immediately set about organising the cleaning of the barracks. She then established a schedule for nursing care and diets. At night she walked the corridors with her lamp, checking on the soldiers, a habit for which she became known as “the lady with the lamp”. Under Nightingale’s supervision, efficient nursing departments were established at Scutari and later at Balaklava in the Crimea. The mortality rate among the sick and the wounded was greatly reduced. At the close of the war in 1860, Nightingale returned to England, where with a fund raised in tribute to her services, Nightingale founded the Nightingale School and Home for Nurses at St Thomas’s Hospital, London. The opening of this school marked the beginning of professional education in nursing. Before she undertook her reforms, nurses were largely untrained personnel who considered their job a menial chore; through her efforts the stature of nursing was raised to that of a medical profession with high standards of education and important responsibilities. Once the nurses were trained, they were sent to hospitals all over Britain, where they introduced the ideas they had learned, and established nursing training on the Nightingale model. Nightingale’s theories, published in ‘Notes on Nursing’ (1860), were hugely influential and her concerns for sanitation, military health and hospital planning established practices which are still in existence today. The Florence Nightingale Museum of nursing history opened in 1989 next to St Thomas’ Hospital, Lambeth and includes some personal effects of Florence Nightingale.